Full disclosure here, I worked part-time as a Birthright Israel NEXT Fellow for a year. The term of my fellowship is up, but if this post comes off as a commercial for Birthright Israel NEXT’s upcoming promotion of DIY Judaism, that’s because you could say that I drank the Kool-Aid. 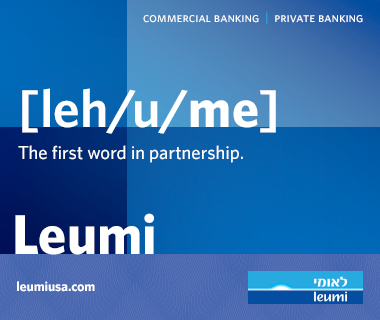 That said, read on to learn how Birthright Israel NEXT will help you with your NEXT big idea. Thousands of 18-26 year olds are going on Birthright each year. For some it’s a fun trip to a new place with some great people and the best part, oh yeah—it’s free. For many, myself included, Birthright becomes a life-changing experience. I remember when I returned from my trip I had learned a lot and I had even more to explore. Like most participants I was first and foremost obsessed with getting back to Israel. More than that, I really wanted to understand what was NEXT. Here I was with a newfound connection to the land and the people that built it as well as a greater understanding of the Judaism that bonded together those people in the first place. When Birthright Israel NEXT started, barely two and a half years ago it served an important role in strengthening the Jewish community. You see, every organization is founded for a purpose. JUF raises money to help people in need and make the community a better place. AIPAC lobbies to ensure Israel is on the forefront of every legislators mind. And a lot of big donors get behind Birthright Israel NEXT because it gets Jews together for the sake of building community. It’s a place for Birthright alumni and their peers to find what’s NEXT. What’s NEXT is DIY Judaism. DIY is “Do It Yourself” and Judaism well, that is entirely for NEXT participants to decide. Call it a meeting, a training, a program it’s NEXT and it is very grass roots—the future of NEXT is really up to you. If the ideal community doesn’t exist for you, Birthright Israel NEXT wants to help you create it. 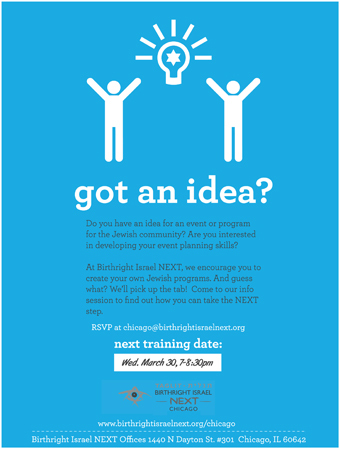 If you are interested in planning your own event for the Jewish community or recently returned from a Birthright trip, then sign up and come on March 30th and learn what it takes for Birthright Israel NEXT to help you with your NEXT big idea.